The Philadelphia Stars were cruising along with a 6-1 record as they hosted the Chicago Blitz in a United States Football League game on April 15, 1984. While they were missing star RB Kelvin Bryant due to an injury, and had to rally to edge the Arizona Wranglers in their previous game, Head Coach Jim Mora’s team was still sound on both sides of the ball. QB Chuck Fusina was behind center to guide the ball-control offense and the tough and opportunistic defense was masterful at generating turnovers and keeping opposing teams out of the end zone. 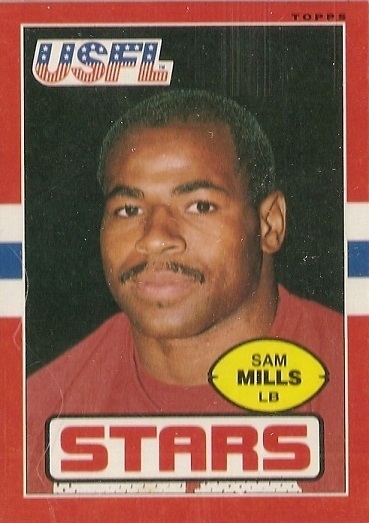 Undersized ILB Sam Mills was particularly adept at making big plays – as the Blitz would find out. Chicago was struggling at 2-5. Coached by Marv Levy, the team had ex-Bear Vince Evans at quarterback but was a shadow of the club that played by the same name in 1983 and, through an ownership switch, had mostly been transferred to Arizona. The Blitz had little fan support and scant success on the field. There were 17,417 fans in attendance at Veterans Stadium. It didn’t the Stars long to make the home crowd happy as they scored four touchdowns in the first nine minutes of the game. It all started when Sam Mills recovered a fumble by RB Larry Canada to set up the first Philadelphia TD. Chuck Fusina threw to WR Willie Collier for a 19-yard touchdown less than four minutes into the contest. Following a punt by the Blitz, the Stars again scored quickly. WR Herbert Harris gained 33 yards on a reverse to set up a 25-yard TD pass from Fusina to TE Steve Folsom. On the next series, RB Vegas Ferguson fumbled at his 35 and safety Scott Woerner grabbed the loose ball and returned it for another touchdown. Just like that, the Blitz were in a 21-0 hole. It continued to go badly for Chicago when the next pass Evans threw was picked off by Mills, who returned it ten yards. The possession concluded with FB David Riley plowing over from a yard out to add a fourth TD for the Stars. In short order, Mills intercepted another Evans throw to give the Stars the ball at their 40. Six plays later, David Trout kicked a 30-yard field goal and, with 25 seconds remaining in the opening period, Philadelphia was up by 31-0. The point total was a USFL record for one quarter. The Stars cruised from there. Midway through the second quarter, Trout added a 49-yard field goal. Once again a turnover had been turned into points by Philadelphia as CB Garcia Lane picked off a pass and returned it 19 yards to the Stars’ 35 to set up the score. Three minutes into the third quarter, safety Mike Lush intercepted an Evans pass near midfield. RB Allen Harvin, the replacement for the injured Kelvin Bryant, topped off the resulting possession with an eight-yard touchdown carry. Chicago finally got on the scoreboard, long after it mattered, with a two-yard TD pass from Evans to OT Doug Hoppock, getting his only reception of the year on a tackle-eligible play. There was no further scoring as the Stars came away with a crushing 41-7 win. The Stars gained 320 yards to Chicago’s 299 and had the edge in first downs by 16 to 15 – deceivingly close numbers since Philadelphia put the game away early and the Blitz vainly tried to play catch-up the rest of the way. More meaningfully, the Blitz turned the ball over seven times, to two given up by the Stars. Chuck Fusina completed 11 of 17 passes for 180 yards with two touchdowns and one interception. Allen Harvin (pictured at left) rushed for 82 yards on 19 carries with one TD. Steve Folsom, Willie Collier, and David Riley each caught three passes, for 56, 52, and 43 yards, respectively. The biggest star was Sam Mills on defense with two interceptions, a fumble recovery, and 11 tackles to fuel the onslaught. For the Blitz, Vince Evans was successful on 18 of 36 throws for 170 yards and the one TD, but also gave up five interceptions before backup Ron Reeves finished up. RB Jim Stone ran for 61 yards on 5 attempts and also led the team with four catches for 37 yards. 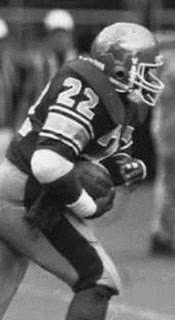 The Stars continued to win with regularity through the remainder of the season, compiling a 16-2 record and three more victories in the postseason that culminated in a USFL Championship. The Blitz also continued to lose, ending up at the bottom of the Central Division with a 5-13 tally. Sam Mills went on to lead Philadelphia in tackles (92) and assists (118) while intercepting three passes and recording five sacks. He was named to the USFL All-League team for the second year.